Here is a yummy smelling starch solution that I created one day after looking for some spray starch at the grocery store. I didn't want an aerosol can of the usual stuff and it was after hours for a local quilt shop and of course, I needed it "now". You only need two ingredients. I got everything I needed from Walmart. It's so inexpensive and easy. I like to use spray starch on my blocks before I square them up. This works great and your sewing room will smell terrific too. I wonder what the next seasonal scent will be? Silverfish & crickets like starch so the quilt needs to be washed after it's done! Bet it DID smell good though! 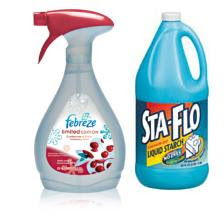 So you are using one cup of the Febreeze, one cup of the Sta-Flo and one cup of water??? 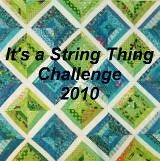 I would love to make my own instead of using an aerosal and the quilting 'starch' is too spendy for me. What a great recipe! Thanks so much! I also have a lot of lovely essential oils from the health food store from when I was enjoying aromatherapy baths. I love the Lily of the Valley scent in mine! We've banned Febreze from our house since we did some research and found that it has neurotoxins in it. I'll bet the essential oils would do the trick though!